The ATXPD is a break-out card which makes it easy to access the various outputs from an ATX power supply. The ATXPD has an LED to indicate Standby power and another LED for the Power Good signal from the ATX power supply. A two-pin header is available if you with to add are remote on/off switch. This header can also be used with a Real-Time Clock to turn on the power supply at a preset time. NOTE: some ATX power supplies require a load in order to power up. Be aware that not every ATX power supply will work with the card. The schematic and layout of the ATXPD are shown below. 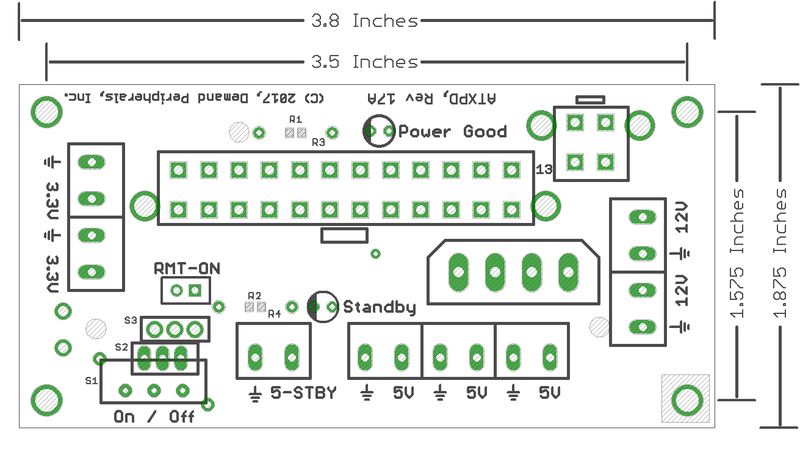 The Eagle schematic and board files are available here: atxpd.sch and atxpd.brd. The bill-of-materials is available here: atxpd.txt.